Have you heard about RuMe? Great concept. It is a Denver based company that created a line of reusable (hence ReUseMe…RuMe) bags, travel accessory bags, even a cuff with a pocket. Yet theirs don’t look like your typical ‘go green’ type bags. These have a sense of style. Recycled aluminum iPhone cases crept into the product offering too. In the interest of safety – both for property and people – RuMe has another product category that could come in handy for our luggage, pets or anything you don’t want to lose. Using QR code technology, RuMe produced a line of pet tags, key tags, luggage tags and decals they call the RuMeID. After purchasing a unit you hop on their secure website to register your information. Then place the tag or decal wherever you choose. Should some kind soul find your coded item they simply scan the code and get necessary contact information – but never all your information – and can reach out to you. Obviously it is a cinch to hop online and change your information as needed, even per trip. 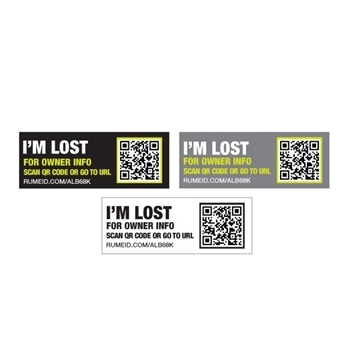 Fido may get lost, but anyone with a QR scanning app can help him find his way home. And if your child has lost a Nintendo DS you can probably relate to the importance of the decals (and fellow sympathetic parents that know its importance in a child’s life). RuMeID pet tags, key tags and decals start at $9.95 with luggage tags starting at $14.95 on their website. And there are a variety of shapes, colors and patterns to suit anyone. What a unique gift idea! Or maybe you need it to just keep track of your own life.